It seems the veterinarian did not observe a spay scar when Dixie was transferred (or admitted). However, symptoms of kennel cough were evident, so her spay surgery was postponed. Therefore, she had not yet had surgery when I adopted her. I was still able to take her home by making a spay/neuter deposit, refundable upon proof I’d had her spayed. A week after I adopted Dixie, I took her to my vet for a check-up and to schedule spay surgery as well as a dental. I could have had her spayed through the shelter, at no cost, but Dixie’s teeth needed cleaning and I wanted to have everything done at my veterinarian’s practice. My vet also did not observe a spay scar. However, upon incision, she could locate no ovaries or uterus. She enlarged the incision – but still located no reproductive organs. She called in the owner of the practice for a second opinion – nothing. 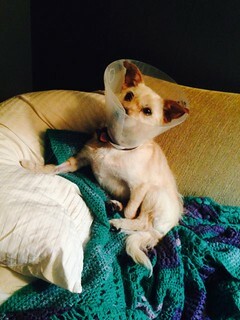 Dixie had already been spayed. She may have been spayed at an early age, and therefore did not present with a scar. In fact, this is why so many clinics (especially those working with animal welfare organizations) tattoo a scar on an animal once it’s spayed. While I regret Dixie had unnecessary surgery, I am glad she had the dental cleaning. Her teeth were much worse than we initially believed. X-rays revealed she needed more than a cleaning. A back molar had fragmented and the tooth as well as the broken fragment needed extraction. A front canine was also in poor shape. The vet was able to perform root planing and save the tooth – for now. So while Dixie had an unnecessary abdominal exploration (and a resulting unnecessary cone), she also had nice clean shiny teeth. I told you I wasn’t broken!